The cloud’s potential for storage and service options has created countless opportunities for businesses to expand or improve their offerings, without requiring costly changes to local networks. But, the cloud is not perfect, and it poses some security challenges. Cloud-based applications can be very convenient, especially for accessing or sharing information when working remotely. However, precautions must be taken to protect sensitive information. Educate the masses. Cloud services are often adopted at the top levels of a business or within specific workgroups, without consulting individual department managers or IT staff. But, it’s critical that end-users understand how to safely use cloud applications before they are adopted to avoid any potential threats. 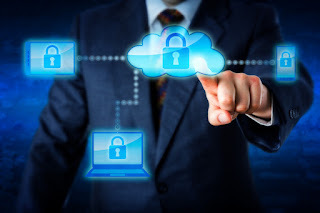 Proper employee training and frequent email reminders regarding secure use of cloud-based applications or files helps to ensure the safety and security of your network and your business. Know your cloud use. Many companies are unaware of the cloud services their employees are using. According to cloud security firm Netskope, 90 percent of all cloud applications are not sanctioned by IT. This opens the door for data breaches, data loss, and account hijacking—which, are generally regarded as the top three threats to cloud computing. Organizations and employees should be aware that simple Internet registration systems, phishing, and fraud schemes can allow a hacker to take control of your account. Thankfully, keeping firewalls updated and teaching employees about best practices regarding cloud usage can easily prevent most of these threats. Protect your files, wherever they are. You can lock down access on mobile devices, but this won’t protect your information if it’s synced to the cloud. Instead, focus on protecting the files themselves with consistent security encryption policies to ensure control. You decide who can view, modify, or print your files, whether they are on a laptop, mobile device, or desktop computer. As hackers continue to experiment with new ways to attack, it’s important for all businesses to mitigate the risks associated with cloud computing by educating stakeholders, investing in data protection, and using encryption safeguards when possible. Cloud security is serious business, so make sure you take the time to get it right. Contact us today at info@momnet.com to learn about cloud-based applications that can help grow your business, and the security solutions that can keep them secure.